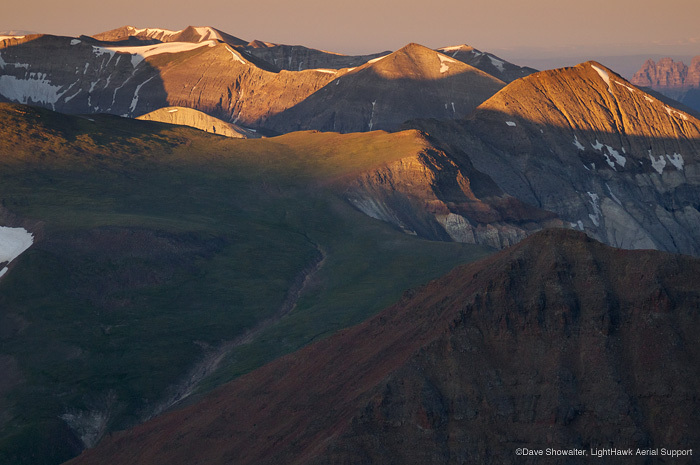 The aerial perspective reveals layers of Absaroka Mountains in golden early morning light. Washakie Wilderness Area, Wyoming. Greater Yellowstone Coalition and International League of Conservation Photographers "Tripods In The Mud" campaign to protect the Absaroka-Beartooth Front in the Greater Yellowstone Region of Wyoming. LightHawk Aerial Support. Photo © copyright by Dave Showalter.